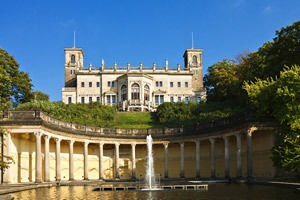 Situated on the Elbe River with excellent views across to it and Dresden, the Albrechtsberg castle was built by the Prussian Prince Albrecht (1809-1872). This castle is crucial for the city because it is one of the few buildings built in the style of late classicism. Albrechtsberg was built on the model of the beautiful and friendly Villa d'Este, and here has a fairy garden which is made of several layers that are associated with meandering paths and are quite pleasant. Terraced garden of the castle is fabulous and extends down to the river Elbe. Albrechtsberg castle is located in the Dresden district Loschwitz, on the northern slopes of the river valley. Very close to it is a beautiful Lingner Castle, also known as Villa Stockhausen, and dominating its facade in Tudor style is Eckberg Castle. Tours of Dresden necessarily start from popular attractions such as the complex Zwinger, Royal Palace, the Cathedral and the church Marienkirhe, passes through the Semper Opera House and up to magnificent Albrechtsberg. The classic design of Albrechtsberg is inspired by ancient Greek and Roman architecture and the Italian Renaissance villas, like Villa Medici. In the first half of the 19th century, Prince Albrecht is already built Villa Stockhausen and he settled there with his wife before the Albrechtsberg castle could be completed. This happened in 1854. Albrecht and his wife Rosalie (Rosalie Countess of Hohenau) lived a beautiful secluded life with her two sons - Frederick (1857-1914) and William (1854-1930). The younger of them remained in Albrechtsberg to the end of his life in 1914. Since that time in the beautiful villa lived his older brother, who, however, in 1925 sold the whole property because of debts from gambling. Five years later, on Easter 1930, Park Albrechtsberg is open for public visits. During World War II, the palace is used as stables and shelter for children. Further, the castle was briefly occupied by the Soviet military administration, having previously been looted. Thanks to architect Köckritz, Albrechtsberg was restored and opened as a hotel in the coming years. Since 1951 it was owned by Jugendheim Berlin, for 1-2 years and then was returned to Dresden. Since 1990 the city government has developed a concept for the use of Albrechtsberg that focuses on the unique characteristics and charisma of the castle as a cultural and historical landmark. Albrechtsberg castle was declared a national historic monument in 1977. Today it is used for many and various events. It houses the hotel and the whole castle, and individual rooms can be rented for various occasions.